The weather here in Ohio since Thanksgiving is not cooperating with my garage insulating project. So I can finish painting the garage, I need to get the garage door insulated. I considered using 2 garage door kits for my 16 foot wide door, but decided after reading reviews and considering the cost (over $150) that I should find another solution. I decided to get 1 1/2″ thick foamboard from my local Home Depot. The foam board came with a plastic tape on one side, and metallic material on the other wide. With the test piece I got, I discovered that it worked perfectly jammed between the upper and lower rails of a garage door section (see picture). I had to cut a vertical relief cut for each section of foam board that way the fit is very tight. I sealed each relief cut with a strip of matching aluminum tape. I did this the first weekend of December. The following day I sanded the drywall to prepare it for paint. I only spent about half an hour sanding, and it still filled the garage with white dust. Next week comes the paint! 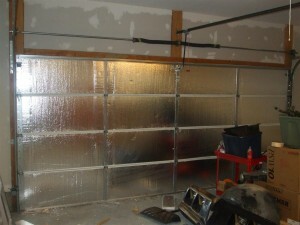 One comment on "Garage Door Insulated"
I just insulated our garage door with the fiberglass kits. There was a Buy One Get One at Lowes so we went with that. I thought briefly about going the foam route. 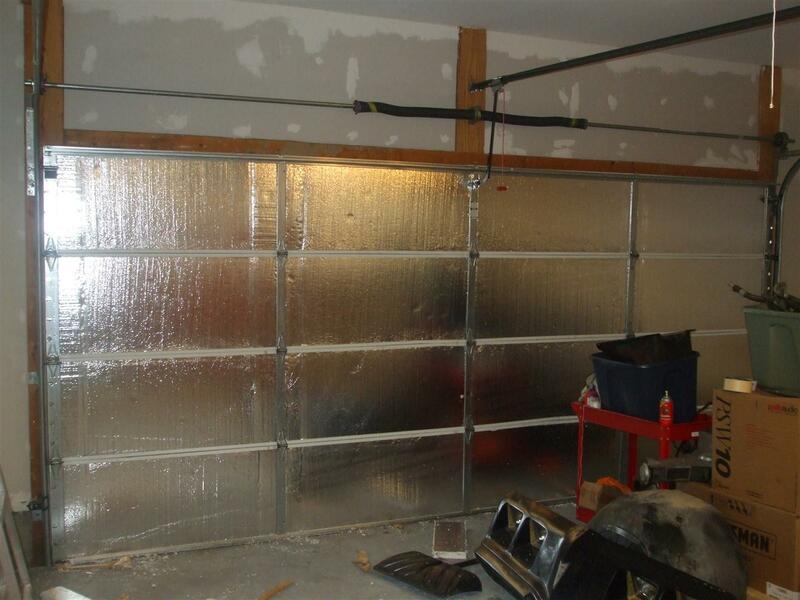 Could you tell a big difference withe the foam on the garage door? I think the jury is still our on my door with the insulation kits.